If fixed braces aren’t for you, we can still help sort out your smile using the innovative Invisalign® system. This features a series of clear, removable aligners that gradually move your teeth to a new position. 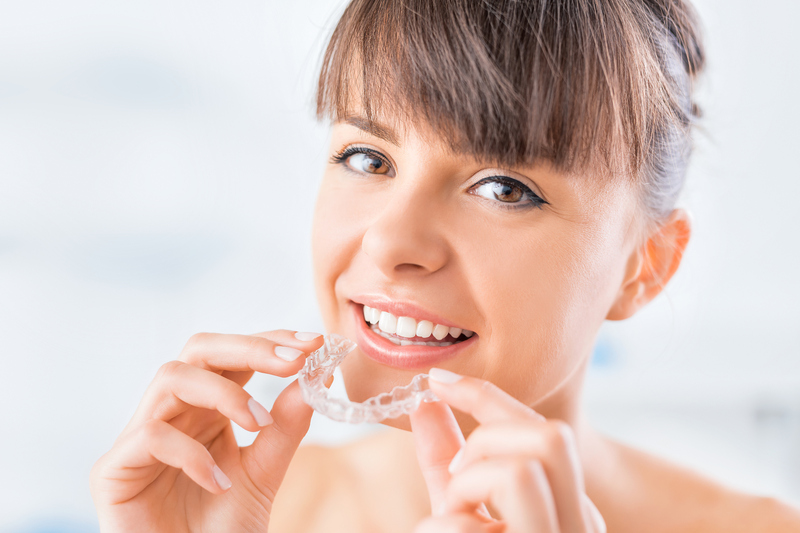 Although generally only used for mild to moderate misalignment, Invisalign can help address overcrowding and gappy teeth, as well as other orthodontic issues. It is a great option for adults as the straightening process is much more discreet. First and foremost, we need to decide if this orthodontic technique will be right for your teeth. If we do think you’ll be able to benefit from Invisalign®, we take impressions and photos, as well as collecting additional information about your teeth. We use advanced 3D technology to create a personalised plan. This will let you see the journey your teeth will take, as well as showing you how they will look following treatment. When the aligners have been made to your unique specifications, you will wear a different one every two weeks, which will subtly bring your teeth into line. For the best and most speedy results, you need to make sure you keep the aligners in place for 22-24 hours a day. With no brackets or wires, aligners are a comfortable choice and you won’t need frequent adjustments either. You can take them out for cleaning and eating, so you’ll be free to indulge in whichever foods you fancy. And you can even leave your aligners at home for that (occasional) special event.